DUNCAN, B.C. 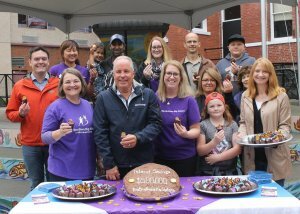 – Island Savings, a division of First West Credit Union and all three Big Brothers Big Sisters’ (BBBS) agencies on Vancouver Island gathered together to celebrate eight valuable years of partnership and to announce a significant financial milestone- $500,000 in cumulative financial support provided by Island Savings to the organizations. Although the financial figure is significant, it is more important to consider what that support has enabled the BBBS agencies to do. Since the partnership began in 2010, the agencies have been able to match over 1,800 children to a positive caring mentor through their in-school mentoring program. The program provides youth with a role model and a friend to talk to and share the experiences of growing up within school grounds. For one hour a week, mentors meet with their mentee and engage in activities such as board games, crafts or simply hanging out on school grounds. In addition to financial support, Island Savings staff have been passionate about supporting BBBS agencies in their communities by serving as in-school mentors, board members and volunteers at BBBS events. Island Savings is a member-owned financial co-operative, providing banking, investment and insurance services for residents and businesses throughout Vancouver Island and the Southern Gulf Islands. As a division of First West Credit Union, B.C.’s third-largest credit union with $10 billion in assets, 250,000 members, 53 branches and 38 insurance offices throughout the province, Island Savings brings innovative products, an extensive branch network and local decision making to the banking experience. Island Savings has a strong commitment to seeing local economies grow and thrive and in 2017, they invested $250,000 and 4,000 volunteer hours into more than 250 organizations. For more information, visit www.islandsavings.ca.